This page documents the journey of Trump’s Free to Play Priest deck during the month of November. For the entire background on Trump’s Free to Play Priest run, which began in September, see Free to Play Priest, Part 1. To read Trump’s Q&A about the “final” version of the deck that made it to Legend, see this page. After spending the month of October concentrating on arena, Trump was able to accumulate enough gold to focus on getting more of Blackrock Mountain. He then began the transformation of the deck by completing the next wing of BRM and disenchanting his golden cards and “bad” legendaries. That gave him the necessary dust to craft a number of new dragon cards to convert the deck to the following version of Dragon Priest. Having run into more slow decks on the ladder, Trump decided to add more late game to the deck. So he did the next wing of BRM to get Chromaggus, subbing out Flame Juggler. After getting enough gold for the last wing of BRM, Trump finally added the much anticipated Blackwing Corruptors, subbing out Chromaggus and 1 Blackwing Technician. It’s worth noting, however, that if he had access to Dark Cultists, he would use them instead and replace the other Blackwing Technician and a Piloted Shredder. In one final(?) change, Trump swapped out a Piloted Shredder for a Dragonkin Sorcerer. 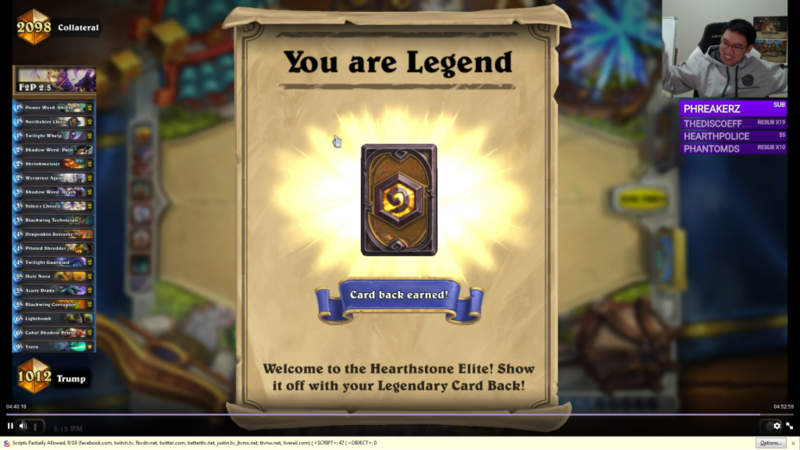 Update November 24, 2015: Trump reached Legend!